Like the other principal gramioids –the sedges in the family Cyperaceae — the grasses are linear-leaved monocots with tiny wind-pollinated flowers. Unlike the sedges, the principla importance of which important is ecological because they benefit wetland wildlife, grasses are important both an important constituents of a great many natural ecosystems and also economically, as the family includes the basic food plants of most civilizations in the form of rice, wheat, corn (maize), rye, oats, barley, millet, and sorghum. This grass fruit is a “grain,” also called a “caryopsis,” i.e., a single-seeded indehiscent dry fruit much like an achene, except that the grain’s ovary wall is tightly fused to the seed and cannot be separated from it except by milling it off (as when white rice is made from brown rice, for example). 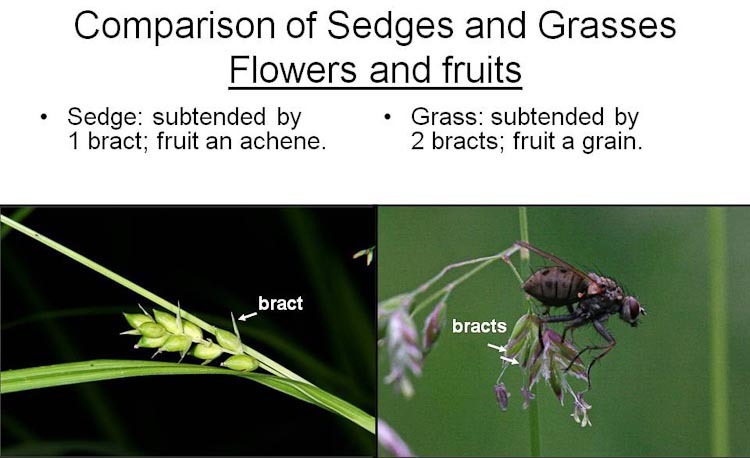 To distinguish a typical grass from a sedge, remember the catchy slogan that helps tell grasses apart from sedges: “Grasses don’t have have edges.” The typical grass stem is round in cross-section. 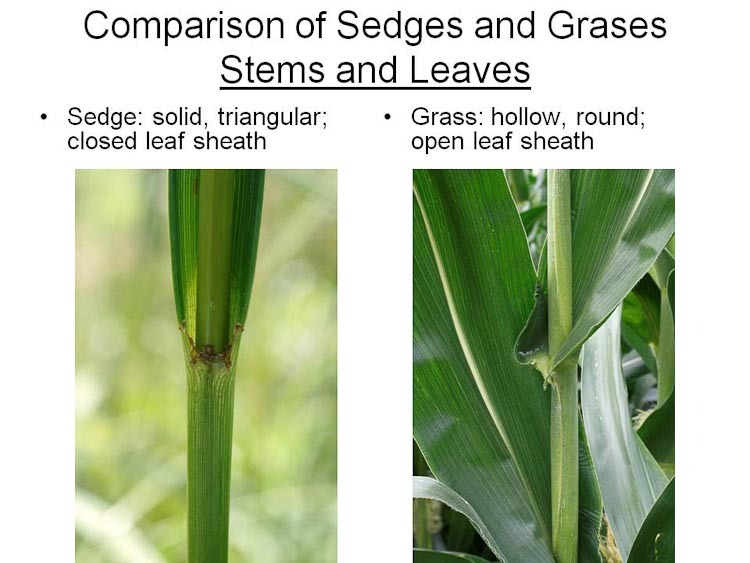 Moreover, the part of the leaf base that wraps around the sedge stem, called the leaf sheath, is open in most grasses, i.e., having free edges, one of which overlaps the other. By contrast, the sheath is closed in sedges, meaning that it is continuous around the stem on the side away from the leaf blade. Graminoids have tiny, wind-pollinated flowers that lack petals and sepals. They are subtended by specialized scale-like bracts, and aggregated into a special inflorescence type called the “spikelet” (a tiny spike). 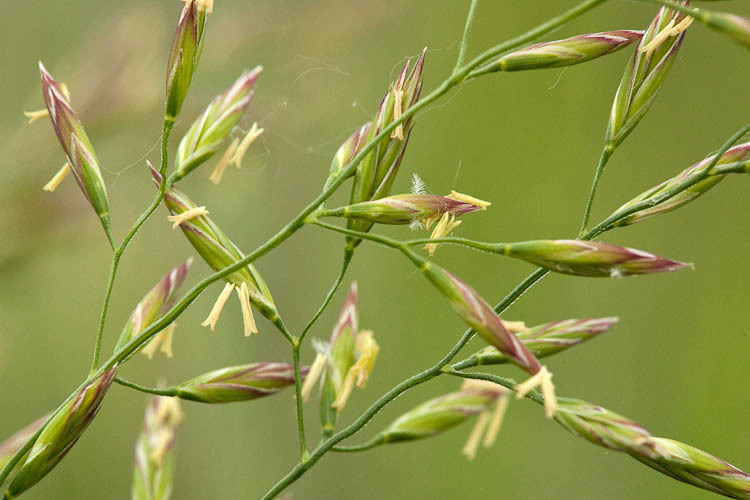 Grass spikelets are flattened with the flowers attached in two opposing ranks, and with a somewhat intricate arrangement that includes additional scale-like bracts found only in grasses. 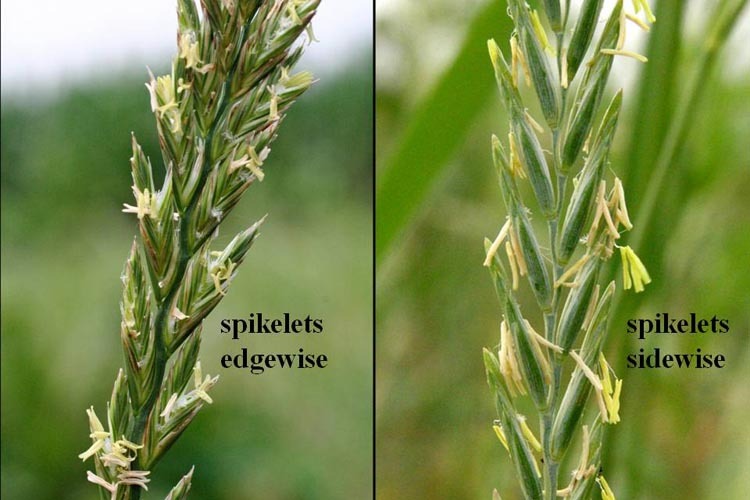 By contrast, sedge spikelets are often (but not always) composed of flowers arranged in tight spirals within which each flower is subtended by a single scale. 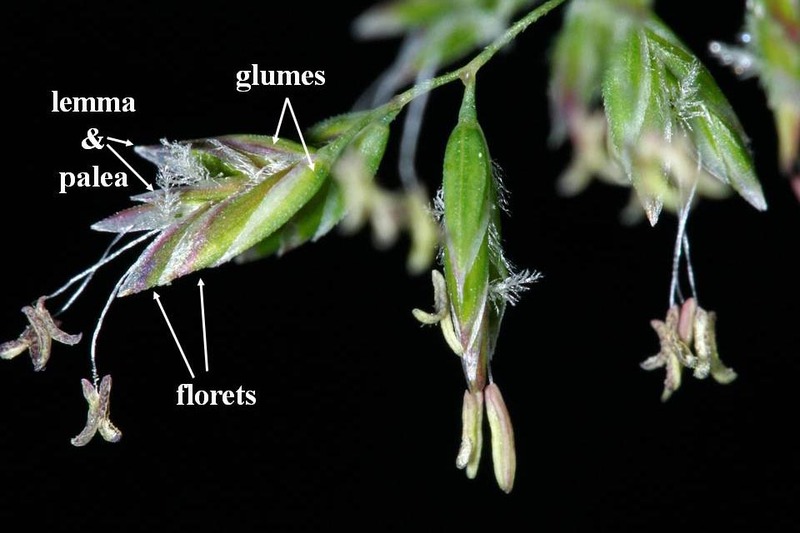 Graminoid flowers are tiny and wind pollinated, arranged in spikelets. 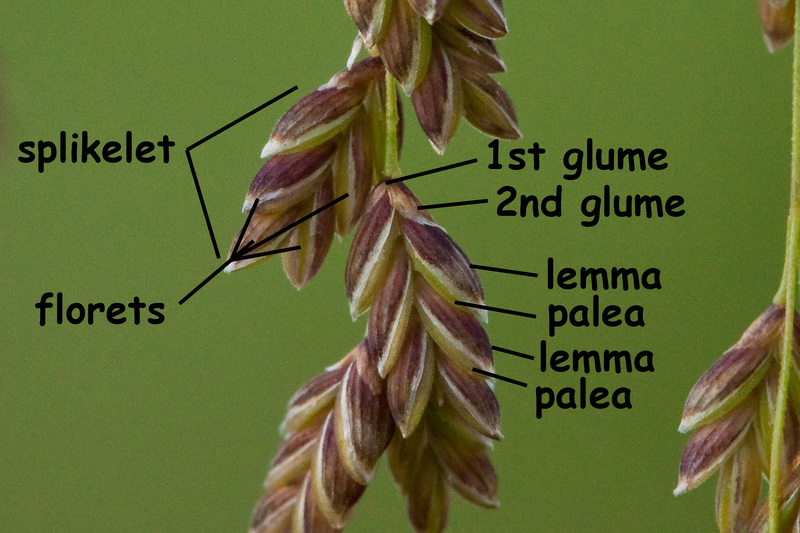 Lemmas and paleas and glumes, oh my! The flowers, such as they are, consist mainly of an ovary topped a short style and a pair of feathery stigmas that are great at catching wind-borne pollen, plus 2 or 3 stamens made up of proportionally large anthers at the end of long thin dangling filaments. A grass spikelet consists of a pair of glumes, above which are located one or more florets. During their brief period of flowering, the feathery stigmas are evident, admirably adapted for the receipt of pollen grains wafting through the air. In complementary fashion, the stamens, with their large anthers and very slender filaments, are excellent pitchers of pollen into the breeze. 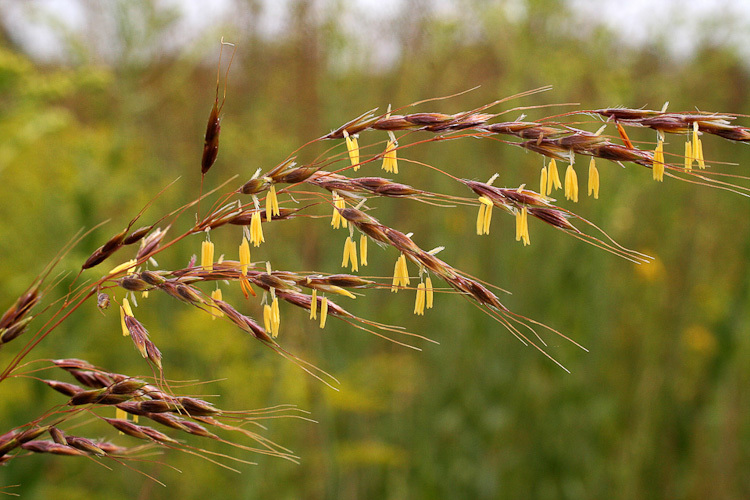 Here for example is switchgrass in bloom. 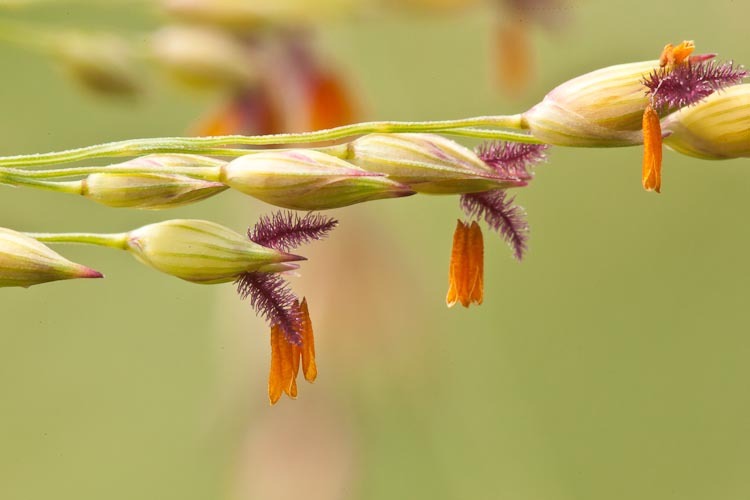 Switchgrass flowers have orange anthers and purple stigmas. While the spikelet is the actual inflorescence type of grasses, the spikelets themselves are arranged in some type of secondary inflorescence. Here are some examples. 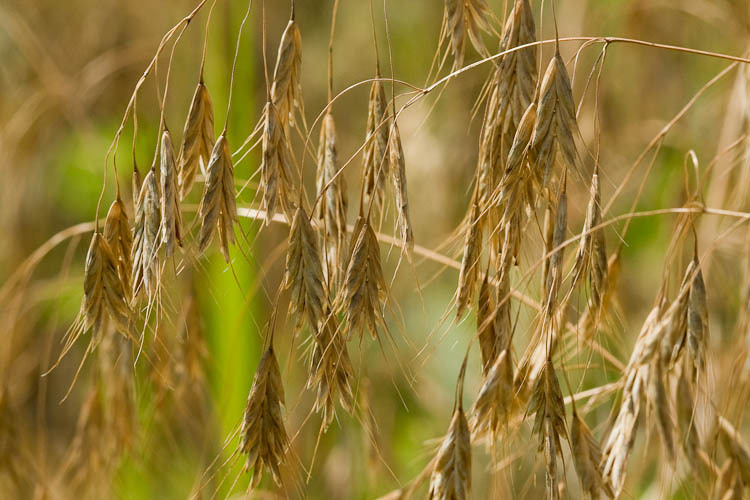 Switchgrass produces a diffuse panicle. Quackgrass and Italian ryegrass both produce spikelets along an elongate spike, but with an interesting difference. Quackgrass spikelets are arranged with their sides towards the stem, whereas the ryegrass spikelets are edgewise to the stem. Left: quackgrass spikelets are sidewise to the stem. Right: rye-grass spikets are edgewise. Awned brome grasses are weedy, with large spikelets in loose panicles. 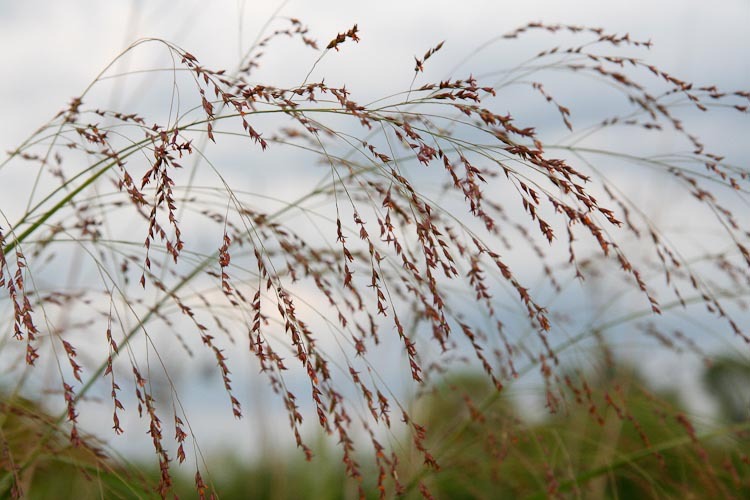 Tall fescue, Festuca pratensis (formerly known as Festuca elatior) is a robust perennial grass that produce several-flowerd, unawned spikelets in an upright panicle. Tall fescue produces a panicle of sveral-flowered unawned spikelets. 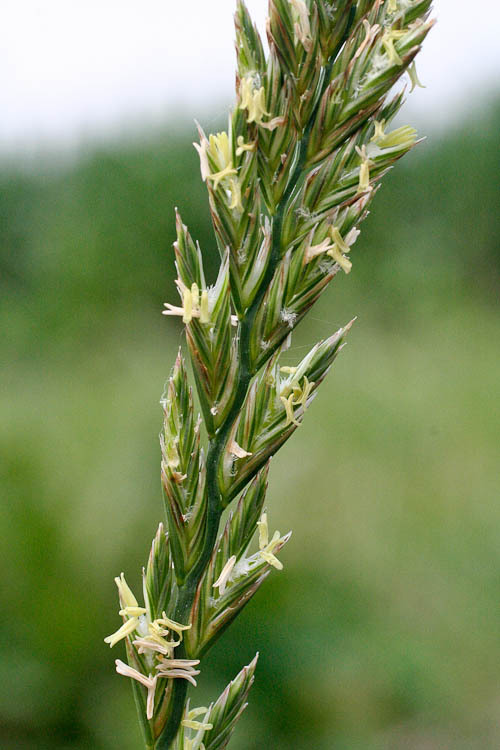 English ryegrass spikelets are arranged in a spike, and placed sidewise to the stem. 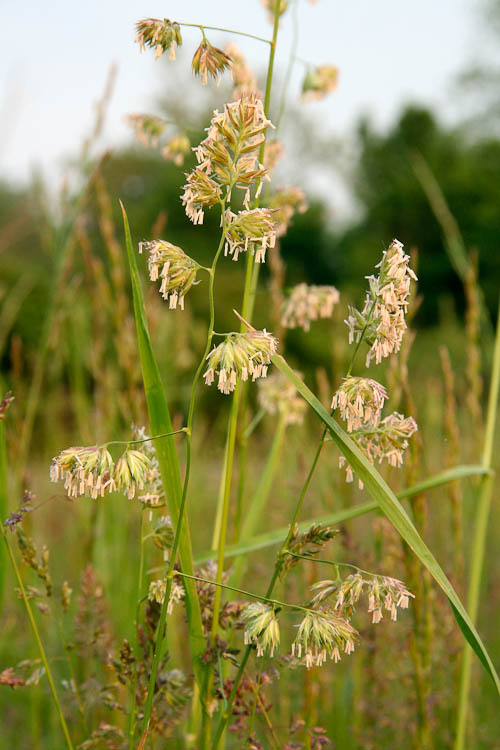 Orchard grass, Dactlyis glomerata, produces few-flowered spikelets in a panicle, wherein they are crowded toward the tips of the panicle branches, looking like little fists. Orchard grass spkelets are clumped toward the ends of the panicle branches.